Chris Mercado joins the list of 100 women and men from Tesla, Amazon, Netflix, Instagram, Twitter, Frito-Lay, Universal Music, Google, Disney, the NBA, and Lyft. [Oceanside, CA], May 30, 2018 /PRNewswire-USNewswire/ -- Fast Company today announced its annual list of the Most Creative People in Business for 2018, honoring an influential and diverse group of 100 leadersfrom a vast range of global industries including tech, design, entertainment, healthcare, media, government, nonprofit, finance, food, and more. I am honored and humbled by this recognition,” says Chris Mercado, “however, this is really a celebration of the team’s collective efforts. Together, we have achieved something very special and I’m proud to be part of such an amazing team. In the fall of 2014, a late-night call sparked the idea for Objective Zero. Justin Miller was struggling after his transition out of the military, he was suicidal and needed support. Justin reached out to Chris Mercado, a fellow combat veteran and friend, for help. Without any type of mental health background or training, Chris did what any friend would do, he listened. That call kept Justin from ending his life and highlighted the power of peer connection. Chris then brought together a team of classmates from Georgetown University to brainstorm ideas on how to tackle the problem of veteran and service member suicide and ultimately came up with the Objective Zero App, offering peer connection and access to resources at the touch of a button. In late 2017, the Objective Zero App was released. 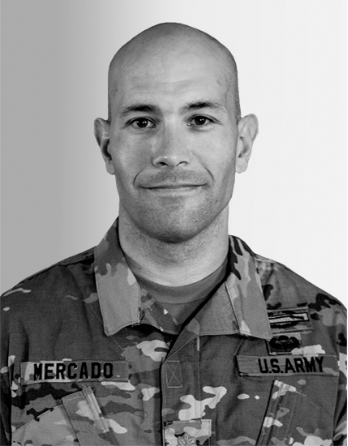 With contributions from co-founders Blake Bassett, Kayla Bailey, Justin Miller, Amy Eastman, and Betsey Mercado, as well as hundreds of volunteers, the Objective Zero Foundation has been able to connect hundreds of veterans, service members, their families, and caregivers to a nationwide network of trained suicide prevention Ambassadors. Fast Company editors and writers spend a year researching candidates for the list, scouting every sector of business: technology, fashion, cybersecurity, biotech, entertainment, beauty, social good, food, data, consumer goods, and more. The people selected have all accomplished something truly innovative within the past 12 months or so that is having a meaningful effect within their industries. They’re also discoveries; none has ever been profiled in Fast Companybefore. Taken together, they represent where business is heading right now. Fast Company is one of the world's leading business media brands, with an editorial focus on creativity, innovation, social impact, leadership, and design. Headquartered in New York City, Fast Company ispublished by Mansueto Ventures LLC, along with our sister publication Inc., and can be found online at fastcompany.com. The Objective Zero Foundation is a 501(c)(3) nonprofit that connects service members, veterans, their families and caregivers to wellness resources and a community of their peers via text, call, and video chat. More information can be found at www.objectivezero.org.